We hosted a webinar about this very subject. The University of Oregon talked about how they’ve had great success year-over-year using an app for their Orientation program. View it here for free. Students are asking to be communicated with in a very specific way, and it’s up to us as administrators to listen. More than 84% of freshman are going to be arriving with a smartphone in hand, and New Student Orientation leaders across the country have found that a dedicated Orientation app is making it easier to deliver the wealth of information that needs to be communicated in those few short days. Let’s take a look at some steps that you can take to create the best Orientation app possible. We’ll answer the two biggest questions. First, what goes inside an Orientation App? Second, how do you get students to use it once it’s been made? At its most basic, an Orientation app is a place to put all the information that you would have otherwise stuffed into a packet or printed book. But we can’t exactly ask students to hang onto that information indefinitely just in case the need for it arises sometime in the future. This fact alone is one of the main drivers behind most Student Affairs pros seeking out an app in the first place. What basic information should you put into your Orientation app? Did you know that there is a Guidebook template specifically for New Student Orientations? Try it now for free. The Schedule: Everyone wants to know where they’ll need to be when during Orientation. The schedule is the core of your app. Within the master schedule, create a separate track for each of the populations your Orientation serves – new undergrad students, parents, transfer students, and grad students. FAQs: Naturally your incoming students are going to have a lot of questions and this is your chance to anticipate and answer them immediately. A great FAQ section can reduce your office’s call volume in the weeks leading up to Orientation. Wondering what to include? Ask last year’s student Orientation Leaders – they’ve heard every question. Student Life: Get a head start on getting new students involved on campus. Your app is a great place to tease out opportunities to join campus groups, volunteer, and socialize. Staff Directory: Making you and your staff available by listing contact information instills a lot of trust and also makes your app valuable beyond the Orientation dates. Some schools go as far as to set up Orientation-specific social media accounts for each one of their Student Leaders where incoming students can ask questions and talk directly to a current student. Your Website: Most Orientation pages aren’t exactly easy to find on a behemoth college website. Link to it directly within your app, and you’ll see your website’s engagement go up. That information alone would make your app a worthy resource. But most of it could be included in the paper booklet you used to hand out to each incoming student. To take your app to the next level, take advantage of an app’s inherently interactive features as well. Interact: If you really want to turn your app into a destination, enable the activity feed. Students and parents will be served the most relevant schedule items instantly, be encouraged to share photos, and can even participate in public discussions right on the home screen of the app. An activity feed instantly turns any app into a living, breathing conversation. Inbox: Enable your app’s ability to directly message each individual user. An message inbox is a great place to encourage engagement with certain parts of the app, or make last-minute updates. Surveys: Want feedback on the app? Want to give students the ability to influence your program’s content? Stick a survey inside and start collecting real-time data! Photo Album: A shared photo album is a great way to get students checking the app often and participating in its content. It’s also the perfect way for you to see your event through the eyes of someone experiencing it for the first time. Social Media: With social media, the conversation around Orientation might be happening on a lot of disparate channels. Gather them all in one place with a social media section of your app. The first question everyone asks after building an app is, “Now how do I get people to use it?” Getting people to adopt and use an app isn’t hard, but it definitely takes a little strategizing. We’ve seen enough successful Orientation apps to offer up some pretty fail-proof marketing strategies. Start early: The most successful Orientation apps have really great adoption before anyone steps foot on campus. Use the channels available to you to encourage students to download and explore the app several weeks before their Orientation session occurs. Tell them in multiple ways: Sending an email about downloading your app is a good place to start, but it’s not the whole answer. Promote it on social media and – for big download numbers – make a video about it. Here’s one that NYU made. Make it a sole source of information: If all the most important information about Orientation can be found within the app – and it’s the only way to get that information – your students will have every reason they need to download the app. Schools that go halfway and supplement their apps with paper booklets don’t see great download numbers. Make it easy on site: When students arrive and are checking in, it’s a great time to make sure they’ve been using the app. Make this question a part of your registration process: “Have you downloaded the Orientation App on your phone?” Have Student Leaders standing by to assist students who haven’t yet gotten the app. Include the parents: More often than not, we’ll see schools with anywhere from 120-200% adoption rates on their Orientation apps. Why’s that? Because Mom and Dad love being in the know too. Marketing to parents doubles your information’s reach and recruits another persuasion channel for getting the students to download the app onto their phone. With Guidebook, you have the ability to host multiple guides within one app. Most schools are hosting anywhere from 3 to 10 Orientation sessions over the course of a summer, which could add up to 3 to 10 separate audiences, depending on how you structure your content. We’re mentioning this because you may want to consider creating a separate guide for each one of your Orientation sessions. Segmenting your audiences like this helps to ensure that the right information is reaching the right group of students. Take pride in your guide and make a great first impression! A little thought about your app’s branding can go a long way. If your app has a cohesive look, is packed with photos, and reflects the larger brand of your university, your users will trust it more from the outset and be more inclined to return to it as a source. Here are the things you need to do to create a good-looking Orientation app. Photos: Associate every list item with a photo. Whether you’ve created a list of food services, offices, campus highlights, or staff – make sure each one has an accompanying photo. Tracking this down can seem daunting, so do what many of our clients have done – hire a budding student photographer to take a series of campus photos. You’ll be surprised how much these come in handy over the course of a year! Icons: Branding your app with custom icons is a great way to reflect your school’s spirit. With Guidebook, it’s easy to change the colors of our existing icon set or upload unique icons provided by your marketing team. Layout: Your menu is more important than you might think. Put a little strategy behind the order in which your menu items appear (and how they’re grouped) so that students can navigate easily through your app. Get started on building your school’s own New Student Orientation app today by clicking the button below! Here’s an in-depth article about making great-looking guides with Guidebook. 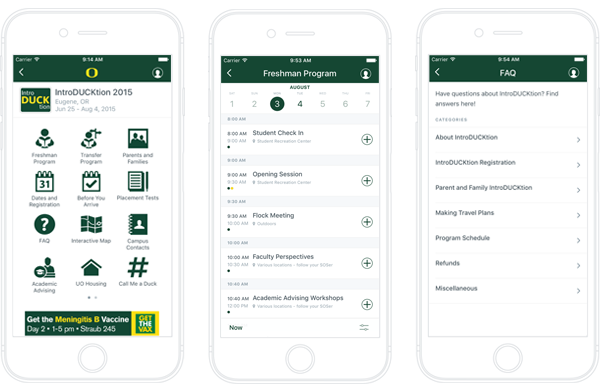 Hear from Keith Frazee, Assistant Director of Orientation Programs at University of Oregon, about how he’s been using an Orientation App for several years. Learn how he structures his content and routinely gets 100% of his incoming class using the app.